Supreme Allied Commander Europe General Philip Breedlove has issued a warning about the build-up of Russian forces on Ukraine’s border. 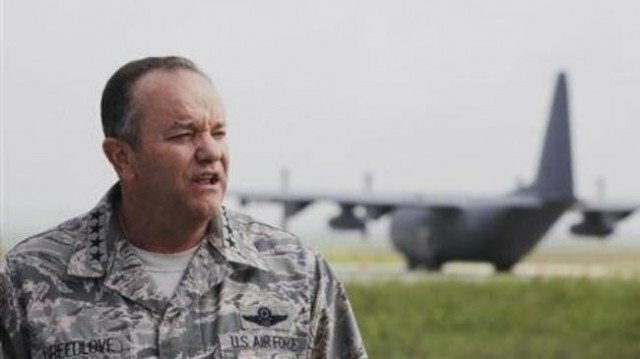 US Air Force General Philip Breedlove said NATO was in particular concerned about the threat to Moldova’s Trans-Dniester region. Russia said its forces east of Ukraine complied with international agreements. The build-up has been allied with Russia’s annexation of Crimea from Ukraine, following the removal of Ukraine’s pro-Moscow president. Moscow formally annexed Crimea after the predominantly ethnic-Russian region held a referendum which backed joining the Russian Federation. Kiev and the West have condemned the vote as “illegal”. Russian flags have now been hoisted at 189 Ukrainian military units and facilities in Crimea, the Interfax news agency reports. The comments by Gen. Philip Breedlove came at an event held by the German Marshall Fund think-tank in Brussels. He added: “There is absolutely sufficient force postured on the eastern border of Ukraine to run to Trans-Dniester if the decision was made to do that and that is very worrisome. Trans-Dniester is a narrow strip of land between Dniester River and Ukraine’s south-western border and it proclaimed independence from Moldova in 1990. The international community has not recognized its self-declared statehood. As Crimea was annexed, the Trans-Dniester Supreme Soviet sent a request asking to join the Russian Federation. Russia’s ambassador to the EU warned the US against sending troops or military aid to Ukraine, saying it would be a “grave mistake”.